What are your favorite vegan pizza toppings? My personal choice? Homemade cashew mozzarella cheese and fresh basil! Learn how to make the ultimate vegan pizza from scratch! there is nothing like home made pizza!!! Using a wooden spoon, combine all the ingredients in a large mixing bowl. Turn the dough onto your work surface. Knead by gently but firmly pushing the dough down and away from you with the heels of your hands for 2 to 3 minutes, adding flour as needed. Cover with a wet towel and let rise in a warm place for 30 to 1 hours, or until doubled. Soak the cashews for 10 minutes in boiling water. Drain cashews and place in a blender along with the rest of the ingredients. In a saucepan, add the cashew cream and bring to a boil stirring constantly until it thickens. Pour into lightly oiled ramekins and refrigerate for at least 1 hours. Remove by turning upside down onto a board. Is it possible to leave out the oil from the cheese? Sure but it might not melt as well! I love your video! This looks absolutely amazing! I’m not too familiar with deodorized coconut oil. Can I use a triple filtered coconut oil instead? If it says neutral taste it’s fine otherwise it’ll taste like coconut unfortunately ! Haha you can use corn starch ! Thanks for the receipe! Just prepered rhe mozarella. Sooo good!!! For how long can I keep it in the fridge? 1 week and you can even freeze it ! I had to Google deoderized coconut oil, and everything I’m reading says to avoid it. Can I use extra virgin coconut oil instead? Or olive oil? Can unrefined coconut oil be used? I read that deodorized coconut oil is supposed to really bad for you. This “cheese” turned out fantastic! I let it set up in the fridge for 24 hours and made two of the best pizzas I’ve ever made. One with veggies, basil and pepper flakes, the other with pesto and spinach. It was creamy, browned and bubbled like a dream and tasted smooth and rich. I’m sold! I am going to make another batch this week adding live cultures. Then I will dehydrate it in blocks. My goal is to dry it out enough to grate and stay solid. Stay tuned! How can I share photos? Cheers! Can these be put in a salt brine afterward? I tried it once when experimenting with other recipes and it made the texture really grainy. Maybe this recipe will work for that? How many does the recipe serve? Can’t wait to try! It depends on the seize of the pizza but 4 people easily ! Hello! Do you think I could use a different kind of flour? Wheat Rice flower or chickpeas flower instead of the regular one? Scoured and hunted for online Seitan recipes. After trying half a dozen, none came even close to what I was looking for in taste and texture. Then EUREKA I came across your website! Thank you for sharing an absolute fantastic recipe; After kneading it, i pat it out thin, cut it into strips, cover with vegetable broth, and Instant Pot it for 16 minutes, I let it cool in the broth, then place it with the broth in containers in the refrigerator. I find it’s best to let it cool to cold in fridge before using. SUPERB! I use it in everything – stir fry, spaghetti sauce, chili beans, soup, etc. The possibilities are unlimited. Is tapioca starch the same as tapioca flour? I see Bobs Red Mill finely ground tapioca flour at my local grocery. J’en ai mis sur un lasagne ce soir! Pas eu le temps de prendre une photographie! Thank you for your recipes that are easy to follow and delicious. Looking forward to the pizza. I used whole wheat flower and to my surprise, my dough ball rising in the off oven with no boiling water rose to the size of a cake! Fortunately, it was kind of airy and light so I just gathered it up in the bowl and reformed it. It resembled pizza dough again after a minute of kneading it again. Why did that happen? Love your work!! Please tell me I can sub the coconut oil for another oil in the mozarella? In Australia we don’t get deodorized coconut oil but it is sold as mild smell and odour – I still don’t like it and could taste a bit of coconut through the mozzarella. Is there anything I can use as a substitute for agar powder? You can try to skip it altogether! It might work as well! Hi I’m just trying to make the base using spelt flour – will it rise as well as plain? Maybe use 50% all purpose flour! Does the pizza dough freeze well? I’ve made the cheese for Raclette, it turned out great! It tastes very good and melts like real cheese. Can’t wait to put it on a pizza. No need to buy vegan cheese anymore. I just made a batch of your mozzarella cheese…..and it’s magnificent…!!! Can’t wait to make pizza. Thank you for this recipe & for all the other wonderful recipes…!!! I’ve got agar flakes rather than powder and was wondering how much to use. Usually, you have to double the amount. 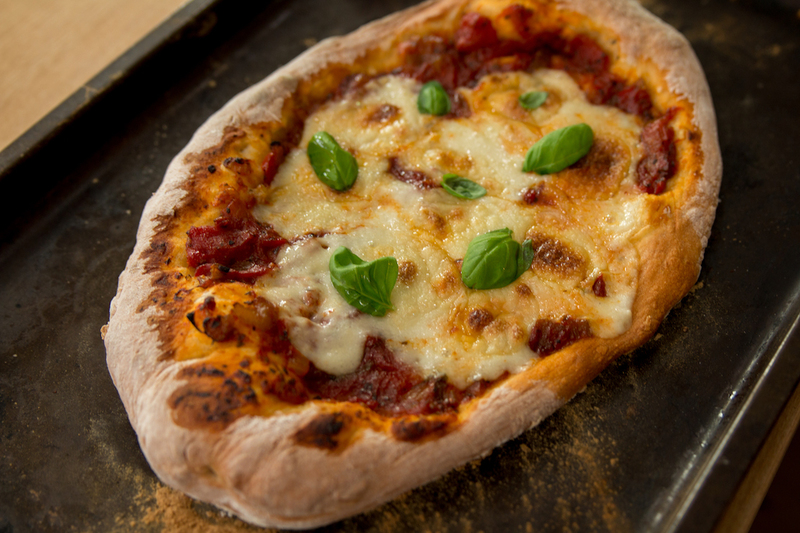 I made the pizza base as a test to have as a bread with your super pasta sauce. During the ‘cover with a wet towel and keep in the oven with a pot of boiling water’ phase my dough was swollen up about 4 times its size! Bigger than the bowl. I salvaged what I could and they turned out like ciabatta type things. I want to re try this week the pizza with cheese and all. I used packets of fast action dried yeast – is there a difference? That’s a good problem since the opposite would have been sad! Just punch it down if it gets too big! I have wanted to make this kind of cheese for ages, but I can seem to find tapioca starch where I live, would it turn out fine if I used corn starch instead of tapioca? As always with The Buddhist Chef’s recipes, these were awesome. My family loved the homemade mozzarella, pizza sauce and pizza dough! We plan on using the sauce for everything it can possibly be used for – it’s so good. We had so much fun making individual pizzas together. Thanks for sharing the recipes. I don’t get nutritional yeast where I stay in India. What can I use as a substitute? what brand are you using for the coconut oil? My husband didn’t believe I made this and it was vegan. I almost teared up at the first bite! Thanx chef!! 5 days and you can freeze it! Can this cheese be used in a vegan Mac & cheese? Thanks! This pizza really looks Delish! Can I leave out the maple syrup when making the “cheese”? I don’t have any on hand. I have white sugar and brown sugar, and pancake syrup, though lol Should I substitute it for one of those or is it okay to leave it out? I’m making this tonight and just realized I have everything except for the maple syrup. You can skip it ! I made this cheese last night for the first time. It was delicious! I made a few changes to the recipe: I used almonds because my daughter is allergic to cashews; I used corn starch because I didn’t have agar powder; and I used light olive oil instead of coconut oil. It wasn’t quite as thick as what I see on your video but almost, and the flavor was great. I’ll definitely make this again. Thank you! If you followed the recipe it should melt !! I just made my own batch with canola oil, (at my own risk because it was lemon and herbs flavoured) Aaaand it turned out yellowish I think mainly because of the oil colour, but not bad flavourwise. We’ll see after being refrigerated. Do you organise courses to make vegan pizza. Can you use EVOO, Avocado oil, canola oil or a vegan butter instead of the deodorized coconut oil? Love this recipe! So fresh and delicious! Better than store bought vegan pizza’s. My partner loves the “Mozzarella” so much that it’s a staple now. Is it possible to substitute a whole avocado as the oil component? It might change the color a bit but it provides the oil, perhaps? I made pizza with this dough and it was really great. Only have a problem making the cheese… Here in Chile the coconut oil, agar-agar and nutritional yeast are very expensive ingredient. So, is there other ingredients instead of, Or maybe doing the cheese without them? Any advice will be great!!! Those are key ingredients unfortunately, maybe you can try ordering online? Can I use agar flakes instead of powder? Sure but you’ll have to double the amount! I made this recently and it is by FAR the best vegan cheese I’ve ever had!! My kids and husband also loved it- and they couldnt even tell it was vegan when i used it in quesadillas. i’m wondering though if filtered coconut oil is necessary, or any veg oil would work? The recipe was so good that I don’t want to mess with it. Thanks!! I didn’t try with any other type of oil. I use coconut oil because it’s solid at room temperature. I have made many vegan pizzas since I converted a year ago but this is the best one yet! Your mozarella cheese recipe is just perfect, the best I’ve ever made. Thank you so much! The first time I used this recipe, I just made the cheese. It was good. Today, I also made the dough – OMG the dough recipeeeeeeeee is fantastic. I am in love. The best, hands down. And there was no work involved!! The cheese is great too – it might be my pregnancy taste buds, but I left out the maple syrup and preferred it that way!! Thank you so much for this delicious set of recipes. Cannot rave about them enough! Haha sure you can freeze it! I picked up vege gel by accident, which meant that it didn’t melt but no bother, it was still super delicious and quickly demolished by my incredibly fussy 2 year old so I am genuinely thrilled right now! Will give it a go with the correct ingredients next time. What about the black olives? You forgot the black olives! Looking forward to making this tomorrow. Is the pizza dough for two pizzas? Just made the cheese, it looks and tastes delicious!! Can’t wait to pout it on my pizza later!! Thank you for such great recipes!!! Hi Buddhist Chef. My question for the cashews is. How the cashews must be for the recipe? Or How can I buy them? Roasted? raw? Thanks for sharing that amazing vegan pizza recipe. Unsalted that’s the most important! allo je nai pas de tapioca starch …il y a til un ingrédient qui pourrait le remplacer? merci! De la fécule de mais pourrait fonctionner! It doesn’t melt at all without the oil, but it’s still tasty. I think they’re may be an error in the cups to grams conversion. A tablespoon is usually 15g not 5g? And 1/4 cup of cashews isn’t 65g! Please help? I just made this pizza for the first time! It is so good! Thank you for the recipe! What temperature do you bake this at? I’m having a hard time getting the cheese to brown without burning top of the crust (I also use a pizza stone). Chickpea flour definitely does not work even mixed with a grain flour, it just becomes a paste that is unworkable no matter how much more flour you add. I finally found that 50% Quinoa flour with 50% organic all purpose flour and it turned out amazing. Stick with the grains and mix with the all purpose flour and experiment. This mozzarella recipe is amazing! We have had pizza for dinner at least 4 times since I discovered it. Also, I tasted it before it set up, and got the idea that it would make a good cheese sauce. So I left out the agar, added 1 TBS of (mild) miso, and after it thickened up I added pasta (2 cups before cooking). It makes a delicious mac and cheese that sets up kinda like baked macaroni on the fridge (I almost like the leftovers better the next day). I think I’m going to make it as a make-ahead dish for Thanksgiving that I can heat up in the oven with some breadcrumbs on top. I’ve tried so many (difficult) recipes for vegan mac and cheese, and this is so easy and delicious! Hi, can I substitute nutritional yeast (mozzarella recipe) with something? Or maybe just skip it? Tapioca starch is tasteless but i guess you can use corn starch. This pizza recipe is 100% perfect and consistent. The cheese is actually extremely versatile and goes great on a ton of things. You can just eat it with chips as a dip, slap it on some crusty white bread, in a quesadilla, nachos, burritos, and the baby even eats it on crackers. I actually alternate between the Thug Kitchen cookbook tomato sauce and the BC sauce and it’s hard to say which is better on pizza. This recipe makes enough to make 4 or 5 small pizzas and that’s a damn good dinner for a family of three. Scope out your local Asian market. Just call them up and ask them. They come in little white envelopes. From Foley, AL, we drove to Pensacola just for agar agar powder and they were just over a buck apiece. We picked up ten, made this cheese about ten times and still have five left! Oh, lasagna! What a great idea! The dough rises CRAZY with me, as well. It’s not a bad thing, just the yeast working it’s Co2 bubble magic! Don’t knead it again! Just cover your hands with flour, gently scoop it up, let a little droop, and pinch a softball sized chunk off. A good tip is to shape it with a thin center and thicker edge so the center is crispy instead of droopy. You don’t want molten mozzarella in your lap. Coconut is solid below room temperature, which gives a better consistency to the cheese once it cools enough to eat. There really isn’t an oil that does that besides Crisco. Other alternatives could be Country Crock butter or just use olive oil. Maybe give that a shot. The trick with many and most recipes is working with what you’ve got and that usually requires a little experimentation. Good luck! I’ve tossed it in a bag and froze it for a couple months. You just throw it in the fridge the day before and when you’re ready to use it and leave it on the counter for 30 minutes to warm up before shaping. It’s not the same as fresh dough, though. Don’t knead it again after freezing! You want to keep as many of the air bubbles as you can for good texture. Use a huge bowl and be gentle when you tear or pinch off a piece and shape it! Make the center a little bit thinner so your slices aren’t droopy! Have you looked at ordering some online? It’s less of a headache. 75 Rupee or less per ounce is a good deal. The only relatively similar substitute for this already-a-parmesan-substitute is two use two tsp of brewer’s yeast for every tbsp in the recipe. You should probably just skip it, but it won’t reach its potential cheesy flavor. Nooch is about $1.25 an ounce in store, $9.00 a pound on ebay. It depends on the density and shape of the ingredient in the measuring cup, so there isn’t a clear universal conversion for every one thing. The 1/4 cup of cashews is presumably whole so crushed would weigh more. If you are stuck with salted cashews, it’s probably because they are cheap and nuts oxidize quickly, so companies use salt, coatings, and flavorings to hide the bad taste and preserve their products to reduce loss. That said, the best way to deal with salted cashews is to quick rinse them first in warm water, then soak in boiling water. If you just soak them straight in the boiled water, the salt dissolves and the cashews soak it in. Two large ones, probably 4 personals. I love this recipe -thanks so much! We have pizza night every weekend and everyone tops their own pizza. My daughter describes the cheese as ‘everything’ and ‘vegan-life goals’ I’ve stopped using the coconut oil and using a liquid healthier oil, its easier, it still works fine, just doesn’t set as stiff when cold, but melts and drips and browns… so good! Thank you! Thank you for the recipe! Although it’s not a thin crust Italian pizza we enjoyed it very much. The recipe is easy to make and very tasty. Your vegan mozzarella, OMG is a game changer. Next time we have friends coming over for dinner, we know what we will make. I love your website and all those wonderful vegan recipes, thanks so much for sharing them! I was literally jumping in circles!! Thanks again for that great cheese recipe!